How do you identify peer reviewed journal articles? How can I tell if other sources are scholarly? Scholarly sources (also referred to as academic, peer-reviewed, or refereed) are written by experts in a particular field or discipline of study and serve to keep others interested in that subject up to date on the most recent research, findings, and news. Peer-reviewed articles are read by subject experts ("peers" of the author) before they are published in a journal. These experts evaluate this source as part of the body of research for a particular discipline and look for mistakes, suggest the author make changes to the articles, and may even recommend that an article not be published at all. The purpose of peer review is to ensure that the highest quality articles are published. Ulrichsweb lists journals and indicates whether they are peer-reviewed (refereed). It is NOT used to search for articles on a topic. Examine the Instructions to Authors page that most journals provide to assess if the submission process involves reviewers or referees. Use Google to find the journal's web site and look for Instructions to Authors or Submission Guidelines. 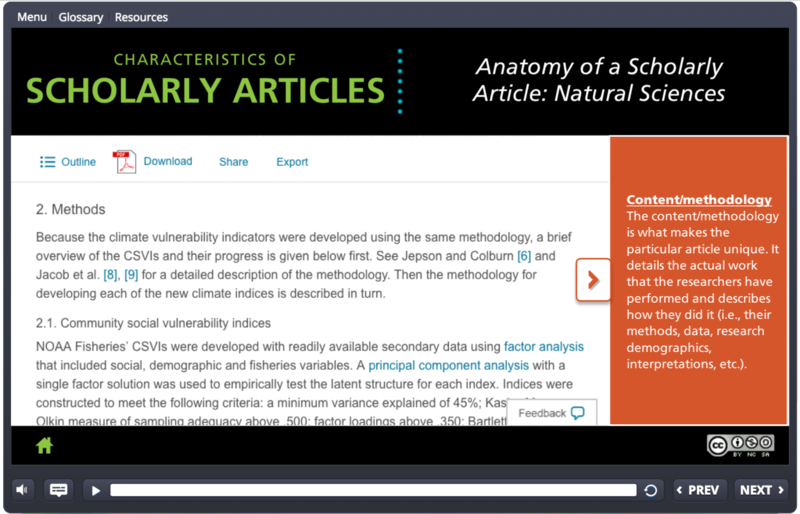 Examine the first page of an article to see if it provides the date when the article was revised or accepted for publication. This does not confirm that the article was peer-reviewed but offers one piece of evidence. Articles are not the only sources that can be scholarly or peer-reviewed. The following characteristics can help you differentiate scholarly sources from those that are not. Be sure and look at the criteria in each category when making your determination, rather than basing your decision on only one criteria. Are the author's credentials provided? Are the credentials relevant to the information provided? Who is the publisher of the information? Is the publisher an academic institution, scholarly, or professional organization? Is their purpose for publishing this source evident? Who is the intended audience of this source? Is the language geared toward those with knowledge of a specific discipline or the general public? Why is the information being provided or the article written? Are there references to other writings on this topic? Are there charts, graphs, tables, and bibliographies included? Are conclusions based on evidence provided? Is the date of publication evident? Is currency of the information crucial to your research?